Soak cashew nuts in little water and then grind it to a paste. Mix this with thick coconut milk and keep it aside. Heat oil in a large pan, add cinnamon, cloves, cardamoms and ginger and saute well. Add slit green chillies and curry leaves and saute for a minute. Add turmeric powder and kashmiri chilli powder and mix well. Then add cleaned chicken pieces and salt and mix well for 5 minutes. Add thin coconut milk and vinegar, mix well and cook covered for 10 minutes. Now add chopped tomatoes and cook covered for 6-7 minutes. 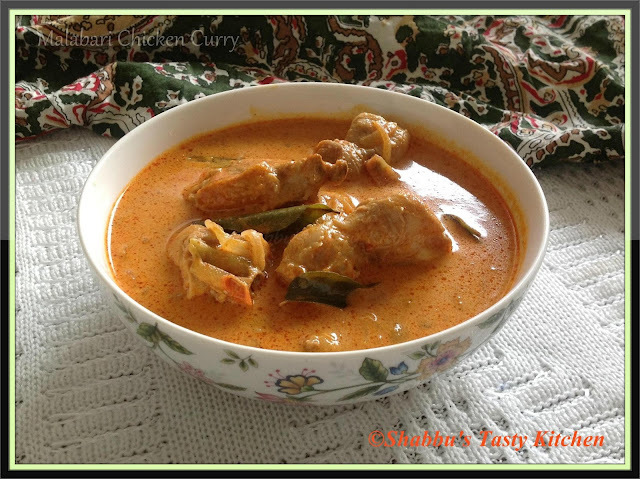 Add the cashew-coconut milk paste to the prepared curry and bring to a boil at medium heat for 5 minutes. Check for salt..
wow this is different kind of chicken curry recipe . I'll cook it someday!